Interview with Karl A. Pillemer, Ph.D.
Home Positive Psychology and Coaching Interviews Interview with Karl A. Pillemer, Ph.D.
BEN’S INTERVIEW WITH KARL A. PILLEMER, PH.D.
On April 27, 2012, we had a wonderful Q&A Interview with renowned gerontologist, sociologist and author–Karl A. Pillemer, Ph.D. Please know your email address is safe with us. We will not share or sell your email address or personal information to any person, organization, or third party. After a chance encounter with an extraordinary ninety-year-old woman, renowned gerontologist Karl Pillemer began to wonder what older people know about life that the rest of us don’t. His quest led him to interview more than one thousand Americans over the age of sixty-five to seek their counsel on all the big issues- children, marriage, money, career, aging. Their moving stories and uncompromisingly honest answers often surprised him. And he found that he consistently heard advice that pointed to these thirty lessons for living. Here he weaves their personal recollections of difficulties overcome and lives well lived into a timeless book filled with the hard-won advice these older Americans wish someone had given them when they were young. Offering clear advice toward a more fulfilling life, this book is as useful as it is inspiring. ABOUT KARL A. PILLEMER, Ph.D.
Karl A. Pillemer received his Ph.D. in Sociology from Brandeis University in 1985, and has published his research findings and applications in 7 books and hundreds of scientific papers. His extensive research is focused on human development over the life course, with a special emphasis on life transitions and family and social relationships in middle age and beyond. Karl is the Hazel E. Reed Professor in the Department of Human Development and Professor of Gerontology in Medicine at the Weill Cornell Medical College. He directs the Cornell Legacy Project which is systematically collecting data from older Americans regarding practical advice for living. He is the author of a recent book on the project, 30 Lessons for Living, which has received significant national and international attention. The Legacy Project involves several interrelated studies centered on the question posed to older people: “As you look back over your life, what are the most important lessons you would like to pass on to future generations?” In 30 Lessons for Living, results of these studies are presented as practical advice for people of all ages on topics such as marriage, child-rearing, work and career, avoiding regrets, and aging well. Karl is a sociologist and gerontologist whose major interests center on human development over the life course, with a special emphasis on family and social relationships in middle age and beyond. He has a strong theoretical and empirical interest in life course transitions and the effects they have on family relationships. 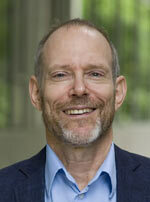 He leads a major program of research on intergenerational relations in later life, with a focus on determinants and consequences of the quality of adult child – older parent relationships. Karl is now conducting a large-scale study of this issue, with funding from the National Institute on Aging, which focuses on within-family differences in parent-child relations in later life and on ambivalence in intergenerational relations among adults. A second major program of research focuses on the nature and dynamics of family caregiving for impaired elderly relatives, which he has been carrying out over the past two decades with funding from the National Institutes of Health. A third area is in long-term care for the elderly, with a focus on the relationships between family members of residents with staff in long-term care facilities. Fourth, Karl has a long-term program of research on conflict and abuse in families of the aged, including several related studies of the domestic and institutional abuse of older persons. Finally, he is actively involved studies of non-pharmacological interventions for older adults in chronic pain, exploring ways to speed the transfer of findings from basic research into scientifically tested interventions. He is co-director of a major center devoted to this topic. Karl’s Legacy Project website is chock full of information and events related to his research and latest book, 30 Lessons for Living: Tried and True Advice from the Wisest Americans. Read inspirational stories and view video clips and photos taken in some of the 1000 interviews. See Karl’s videos of elders sharing their lessons here. Listen to George Noory interview Karl about the Wisdom of Elders on Coast-to-Coast’s 2/5/12 audio recording. Jane Brody’s NYT article, Advice From Life’s Graying Edge on Finishing With No Regrets. 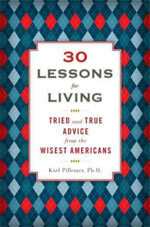 Check out Amazon for a Kindle version of Karl’s new book, 30 Lessons for Living: Tried and True Advice from the Wisest Americans. Karl’s Cornell Website is here.